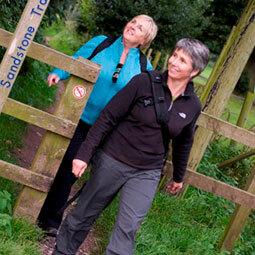 We want you to enjoy your cycling or walking holiday with Byways Breaks. These conditions along with the information provided in the brochure and on the web site set out our contract with you and contain important terms and conditions. Please read this carefully before you make your booking. The contract comes into affect when we receive the booking form (which must be signed by one person who is accepting booking conditions on behalf of everyone on the form) together with your deposit, and we have issued a confirmation. The agreement is governed by all aspects of English law. 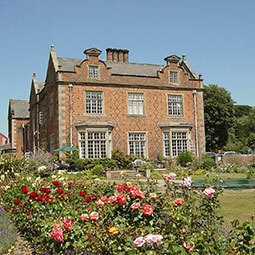 The full deposit of £50 per person for breaks up to 3 nights and £100 per person, for breaks 4 nights and over must be received with your booking. Payment can be made by cheque, credit or debit card. Please note that we make a small 1.5% charge for credit and overseas debit (not UK debit) card payments over £100. We can also take payments by bank transfer. For overseas bank transfers, payment must be made in GB£. Please contact us for bank details. When we confirm your booking we will send an invoice showing the balance of the payment due, and date by when it must be received by us. If you do not make the payment by the due date you will have deemed to have cancelled your holiday and cancellation terms will apply. Where bookings are made less than 6 weeks before the start of the holiday payment must be made in full. In accordance with EC Directive 90/314/EEC your deposit and final balance payments are protected in a client trust fund until your holiday is completed. It is a condition of our insurance that at the start of the holiday we take a £40 deposit for all bikes hired. This is refundable on return of the bike in a satisfactory condition. We recommend that you are fully insured to cover cancellation. If you or any member of your party do have to cancel the holiday you must notify us immediately in writing by recorded delivery, or by e mail. Cancellation rates will be charged as a percentage of the holiday cost on the following scale, from the date we receive your notification. In addition to the above charges, where some members of a group cancel their holiday it may be necessary to add single room supplements to other members of a party and also the group discount may be affected. If you wish to change holiday arrangements we will do our best to accommodate you subject to availability, for an administration fee of £50 per booking, provided alterations are notified at least 28 days before the start of your holiday. Holidays are planned many months in advance. While we always endeavour to avoid making any changes after a booking has been confirmed sometimes it is necessary and we reserve the right to do so. Itineraries are a statement of intent only and not representations or undertakings that they will be carried out. Any changes will not constitute material alterations and we will notify you as soon as we can. In the unlikely event we have to cancel your holiday, including as a result of ’force majeure’ we will offer you an alternative or a full refund. Force majeure means unusual and unforeseeable circumstances beyond our control, the consequences of which neither we nor our suppliers could avoid, e.g war or threat of war, riots, civil strife, terrorist activities, industrial disputes, natural or nuclear disaster, fire or adverse weather conditions, level of water in rivers or similar events beyond our control. All customers should have adequate insurance cover in case of cancellation, accident or loss of possessions. We will do our utmost to ensure you have an enjoyable holiday. If you do have any complaint please notify us immediately and we will endeavour to rectify the problem. Any ensuing complaints should be notified to us as soon as possible in writing, and in any event within 14 days. We want you to have a safe holiday. Byways will ensure that the holiday is as safe as possible, however your personal safety is your responsibility. 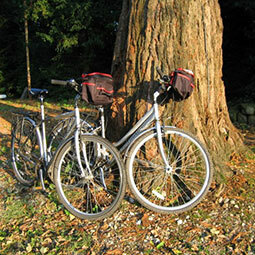 Any person coming on a cycling or walking holiday must be fit, adequately experienced and able to cope with the demands of the holiday. If you have any doubts please consult your doctor. 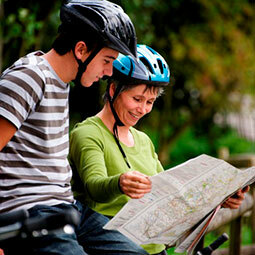 For cycling holidays you must be capable of riding a bike safely. If for any reason, at any time we are not satisfied with your competence we reserve the right to refuse to supply you with a bike or withdraw it from your use. If you bring your own bike please make sure it is in good repair. We cannot be held responsible for any consequential injuries. Should you break down we will do all we can to help, but we cannot be called out to repair your bike or be held responsible. Cars are parked at your own risk. We can take no responsibility for any loss to vehicles or contents.